CARE has developed a set of comprehensive guidelines for emergency preparedness planning, which provides step-by-step instructions and information. These guidelines and workbook are available at Annex 37.1 CARE Emergency Preparedness Planning Guidelines, and 37.2 CARE Emergency Preparedness Planning Workbook. The Guidelines are used by all CARE offices. The planning guidelines include various annexes, which are referenced in the guidelines document, or included as separate zip file below. The zip file also includes a new separate guidance note on cash preparedness (Annex 10). See section 3 of this toolkit for more information on addressing gender in emergencies in emergency preparedness, and see the CARE GiE guidance note series for guidance on gender in emergency preparedness, gender in brief, gender action plans & more. These are all also the CARE Emergency Preparedness Planning Guidelines as annexes. Undertake hazard identification and risk analysis to inform the emergency prepared planning. Collect information on historical disasters in the country and current trends related to migration patterns, emerging conflicts, food insecurity data, etc. Form the emergency response team (ERT) and sub-office structures to support emergency operations. Assign key roles to individuals on the team. A high risk office will require a more extensive emergency response team. Provide orientation to ERT members of basic concepts and emergency protocols. Develop a detailed inventory of office capacities using the CARE Capacity Assessment Questionnaire. Identify any capacity gaps. What modalities of response will be used (e.g. cash, in-kind, technical assistance, etc). Assign CARE’s mandate minimum preparedness actions to the relevant staff. This will not be limited to ERT members, and will include both programme and programme support staff (e.g. finance, procurement, logistics, etc). 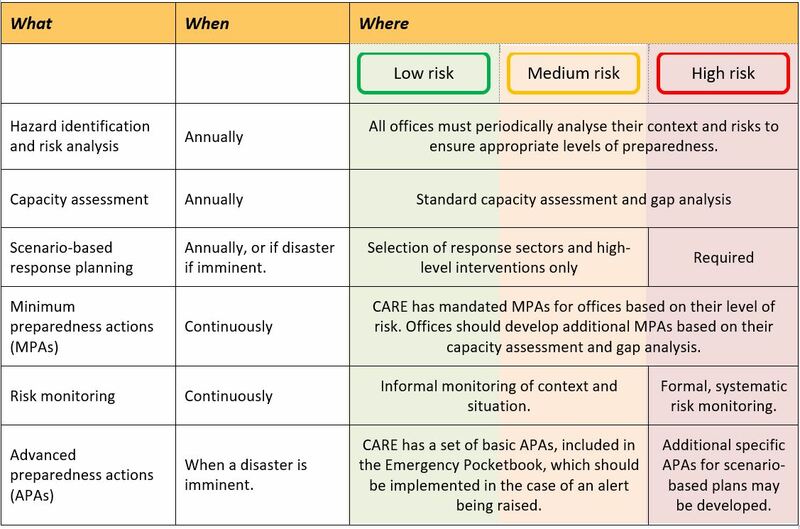 Identify and assign any additional minimum preparedness actions to address capacity gaps identified. Identify and assign any advanced preparedness actions which will be carried out if it becomes likely a response will be needed. Document and share the written plan using the CARE EPP Workbook and/or the Alert Platform (see below. Implement the minimum preparedness actions throughout the year. Undertake necessary risk monitoring throughout the year. Mainstream preparedness and mitigation actions in development projects. Review the plan at appropriate intervals (annually, for high risk offices). See the annexes for sample EPP plans: Annex 37.6 EPP sample-CARE Ghana, Annex 37.7 EPP sample-Sudan, and Annex 37.8 EPP sample-CARE Indonesia. CARE is part of the Alert Consortium, and in 2017 is piloting the use of the Alert Platform in the Philippines and Kenya. 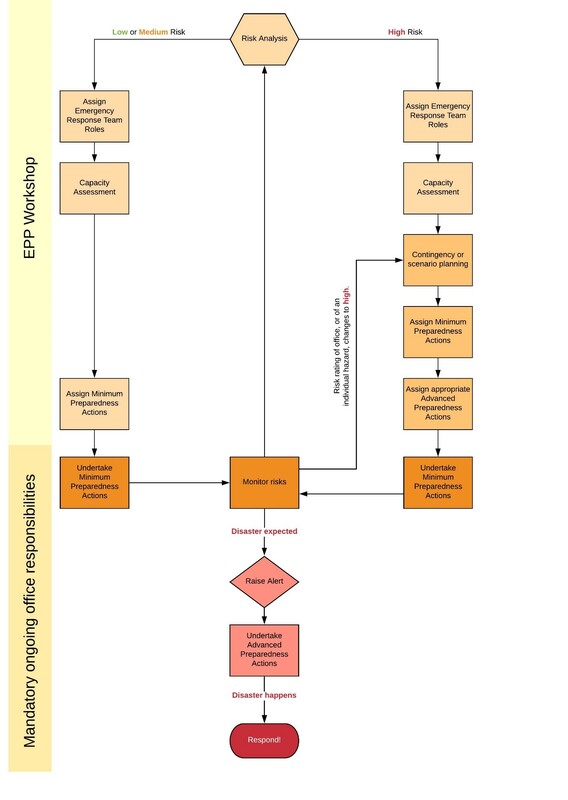 The Alert Platform is an online system for risk monitoring and emergency preparedness planning, with the potential to improve the efficiency and effectiveness of emergency preparedness planning. It allows for networked planning with partners and peers. Offices which are interested in also trialling the software can find out more here, or request further information from alert@careinternational.org.